What’s New and Updated In SharePoint 2016? 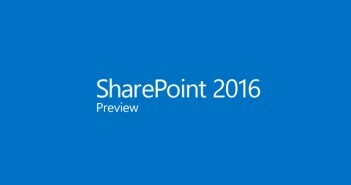 SharePoint 2016 Public Preview Has Been Released! When will SharePoint 2016 be released? New Year New You? Get Yourself Together. Unchain Your Mind. Time To Change It Up A Little With Microsoft’s SharePoint Color Palette Tool! August 26, 2015 0 What’s New and Updated In SharePoint 2016? Information provided by this website and affiliated persons is for educational purposes only. It is subject to change without notice. While we strive to keep the information up to date and correct, we make no representations or warranties of any kind, express or implied, about the completeness, accuracy, reliability, suitability, or availability with respect to the website or the information, products, services, or graphics contained in the website for any purpose. The information contained in this website is not a substitute for independent professional advice and readers should obtain any appropriate professional advice relevant to their particular circumstances. The persons affiliated with this website are not liable for any loss resulting from any action taken or reliance made by you on any information or material posted in this website. Links contained in this website are provided for your convenience to provide further information. The links contained in this website do not signify endorsement of the website(s). We have no responsibility for the content of the linked website(s). Views, opinions, and suggestions expressed on this site are in no way associated with Microsoft and do not necessarily reflect Microsoft’s position. Views, opinions, and suggestions expressed on this site are in no way associated with my employer and do not necessarily reflect my employer’s position. Some information represented on site might be officially unsupported, could potentially damage your SharePoint installation, and could lead to a lack of support from Microsoft. Any reliance you place on information in this website is therefore strictly at your own risk. Ted Hagler on Time To Change It Up A Little With Microsoft’s SharePoint Color Palette Tool! Copyright © 2009 - 2019 Striven Inc. All Rights Reserved.